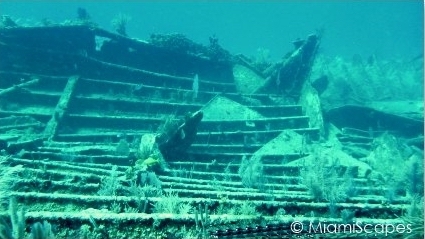 Located north of French Reef, the Benwood Wreck lies 25 to 40 feet deep and is one of the most popular scuba diving spots in Key Largo. Just about every dive shop in the area will schedule a dive at this spot at least once each week so chances to dive it during your visit are good. Originally a 360-foot long merchant marine freighter, the Benwood collided with the USS Tuttle during World War II and sank at its resting place in 1942. 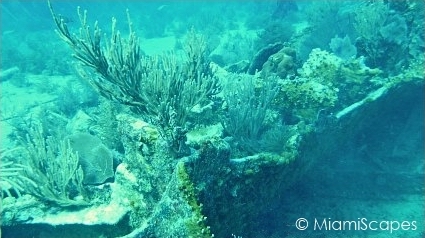 The wreck was dynamited to prevent a navigation hazard, and while the stern of the ship sits nowadays basically in shambles, the bow area is still one of the most well-preserved areas of the wreck and the deepest part at about 40 feet of water. There is no penetration at the Benwood, it is a very easy shallow wreck dive, perfect for any beginner and gives you lots of bottom time. 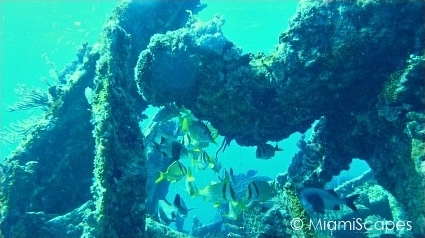 The wreck has become a home for large schools of colorful tropical fish. 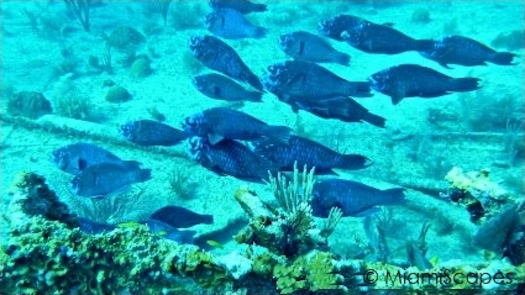 On any one dive you are likely to see schooling yellow and blue-striped grunts, as well as goatfish and schoolmaster snappers, angel fish, parrot fish and pork fish among others. There is lots of coral growing on the wreck, beautiful sea fans and sea rods in abundance..
...just the usual schools of schoolmaster snappers, porkfish, a green moray hiding underneath in the sandy bottom, a scorpionfish trying to camouflage itself on the wreck, same as the lizard fish not far from it. 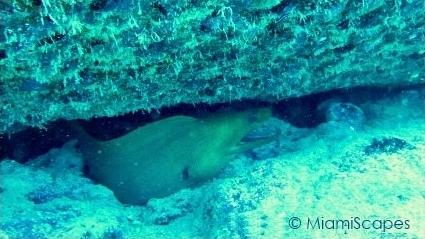 More yellow grunts appear, and the beautiful sea plumes that cover the wreck. 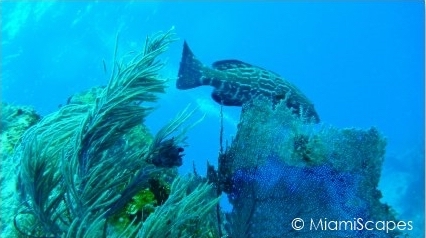 Then out of the blue, literally, comes a curious nurse shark just ambling along, came straight at us to check us out and then swerved back in a sharp u-turn and thankfully avoided a collision! We also saw on this dive a scrawled file fish, a spotted eel in a crevice, and more schooling goat fish, pork fish and schoolmasters. 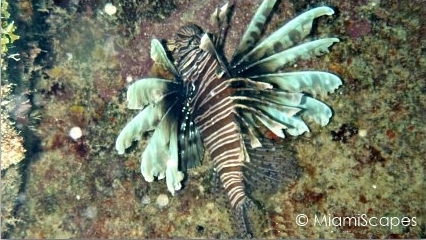 The Benwood Wreck is a great spot, we love diving it time and time again, you never know what you will find here!